Spring Cleaning! 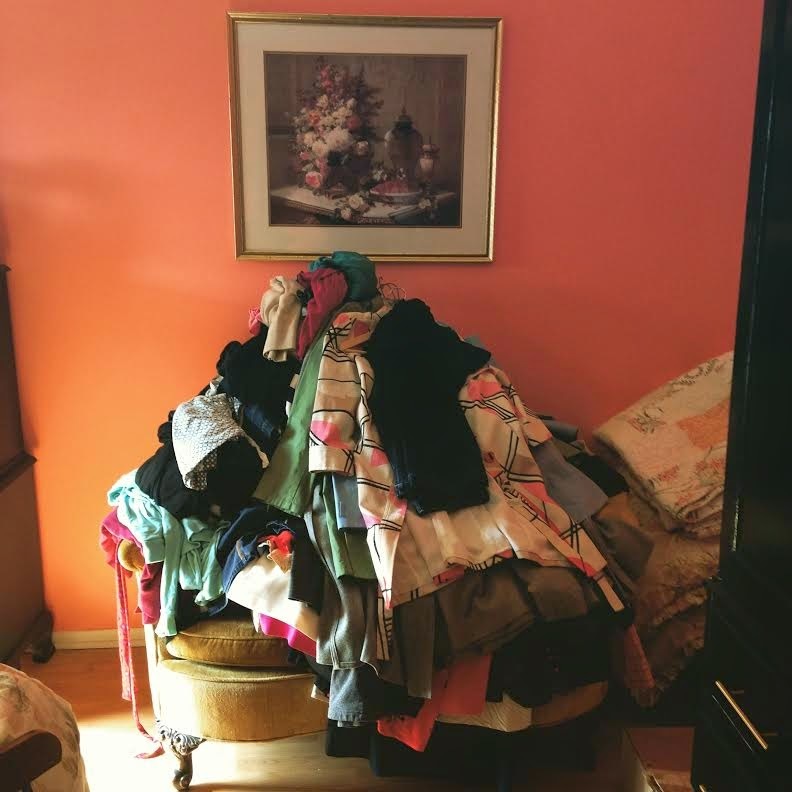 The KonMari Method! Does it spark joy? HomePunky HomesteadCraft PunkSpring Cleaning! 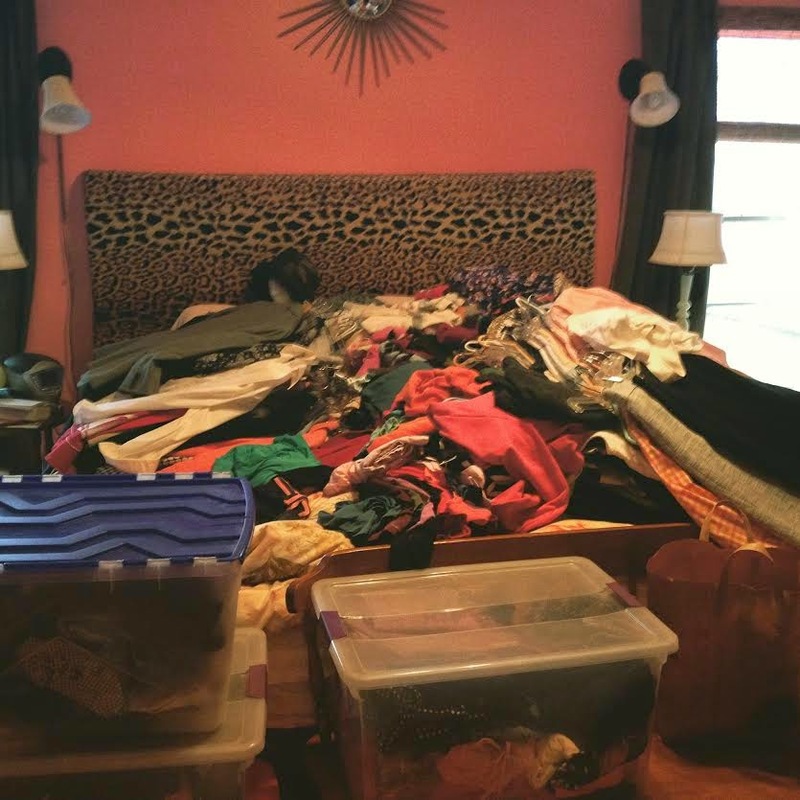 In the mood for: the KonMari Method! Spring Cleaning! 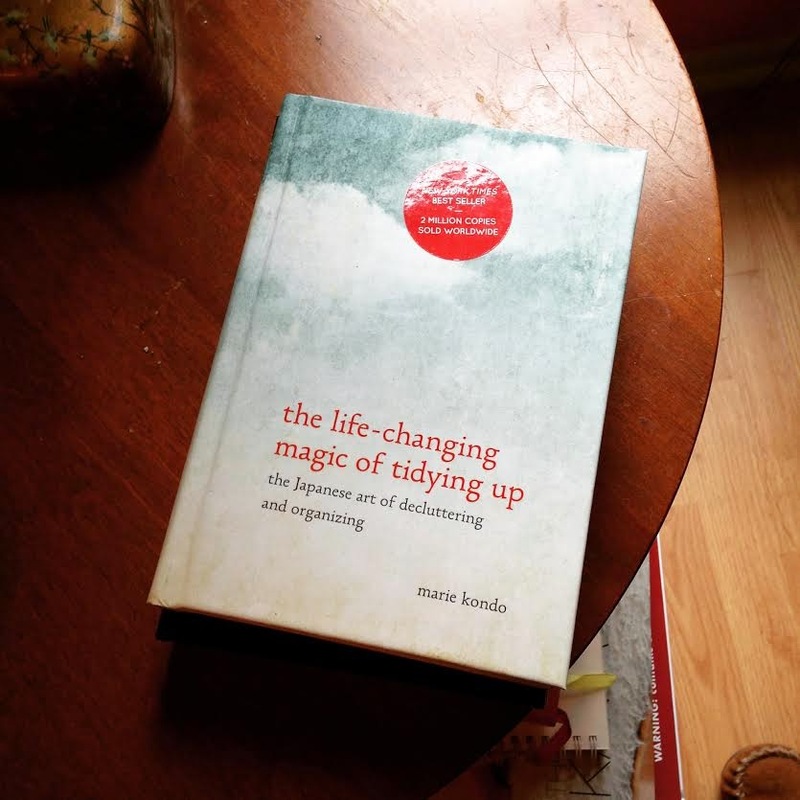 In the mood for: the KonMari Method! So, I got this KonMari method book for my mom for Christmas, only it turns out that she bought it for herself, so I kept it. Marie Kondo’s revolutionary technique, (the KonMari Method) is basically that we should get rid of 50-75% of what we own, and only keep the things that “spark joy.” The KonMari Method is, apparently, super popular in Japan. It hadn’t occurred to me before, but apparently the Japanese are as big consumers as we Americans are! And being a consumer culture means that we acquire a lot of STUFF. And owning a lot of stuff is stressful. 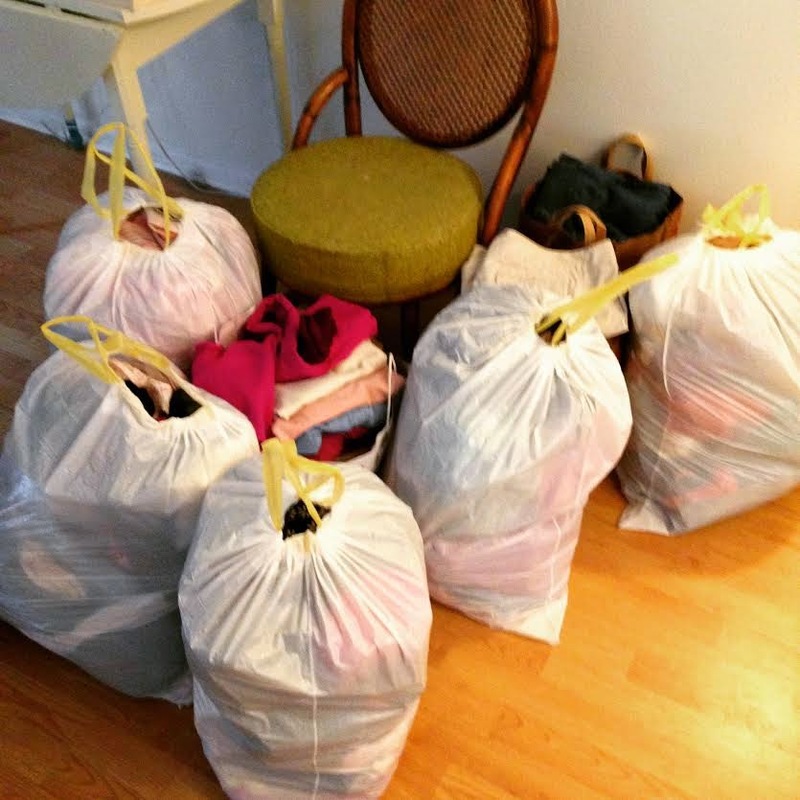 So, I decided to try out the KonMari Method. Here we go! Step One: Gather all of your belongings fitting in a certain category in one place. First, off: clothing. 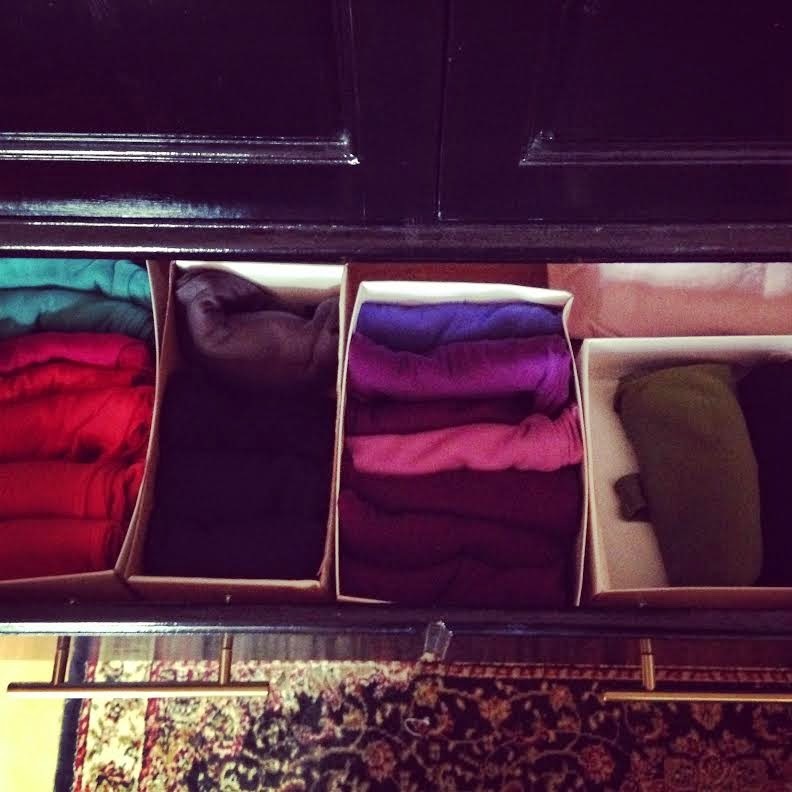 Marie Kondo says it’s easiest to get rid of clothing, because we don’t get attached to clothing, and it’s easy to replace. Um, speak for yourself, sister. It’s essential to gather everything in one place, says Kondo, because then you really get an idea of how much stuff you have. Further, it’s important to go by category rather than by room, because we tend to spread our belongings out in various places. 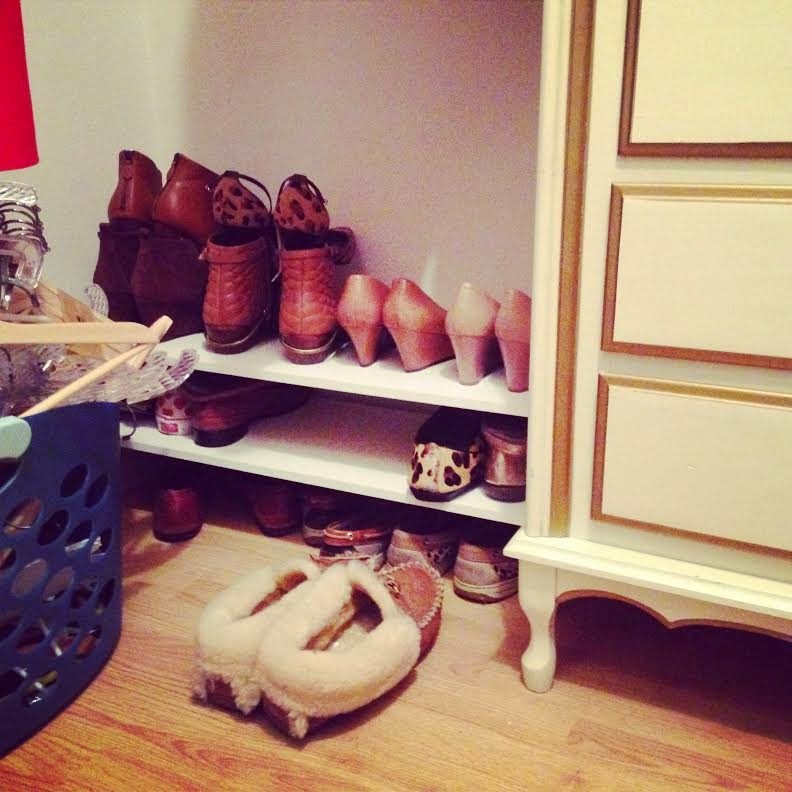 For instance, I had clothing in my closet, in my bedroom, in the guest room, and in the guest closet. Before I started, I made a list of each category and the locations where stuff within that category might be. Kondo doesn’t require you to make a list, but hey, I love lists. So, that’s all my clothing! There were four plastic bins, plus everything on the bed. I did not include my scarves, hats, and belts. That’s a lot of GD clothing, and a ton of it was from 8+ years ago. Step Two: touch each item, and ask yourself, “Does this spark joy?” I love this question, and Brian and I have been asking it about EVERYTHING lately. It might be a difficult concept to grasp, but the way I think of it is like this: does this item make me happy in a meaningful way? I think it’s important to open one’s mind to the whole joy-sparking being intangible or even unexplainable. There are some tops that I love because they look good on me, but there are other items that I love just because I love them. Marie Kondo makes it clear that the joy-sparking must be right now, in the present. There were plenty of items in my closet that had once sparked joy, but no longer did. The joy-sparking can come from an item that you no longer wear, as long as it still sparks joy. This is probably the most joy-sparking thing I own, at least currently. 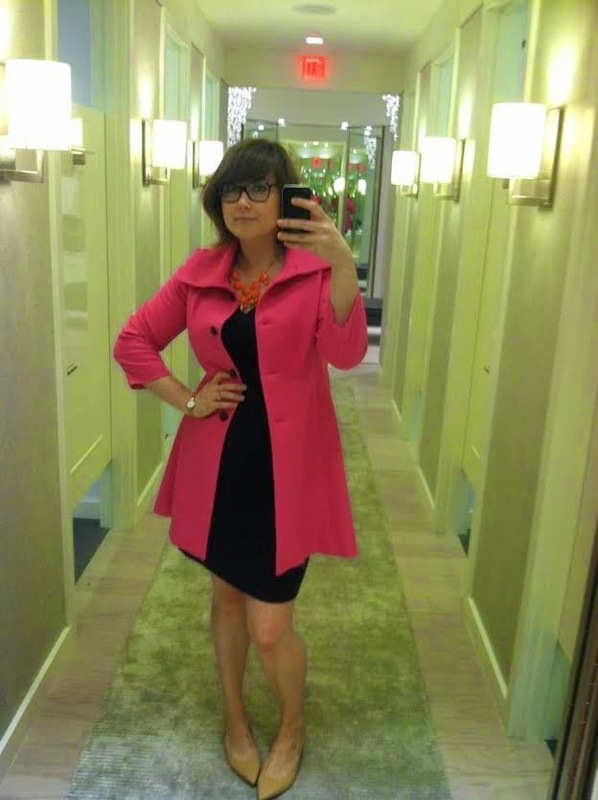 It’s a pink coat, for God’s sake. Joy sparking ALL OVER THE PLACE. In the end, these were the clothes that sparked joy. They’re the things that look good on me, feel good, make me feel good about the world or myself. Those platform sandals almost didn’t make it, but I decided they could stay till summer. If they don’t spark joy then, they’re outtahere. Step Three: When you determine that an item does not currently spark joy, you thank it for its service, and you release it into the world. This is one of Kondo’s concepts that I think a lot of Americans will find bizarre and silly, but I love it! I read somewhere that Kondo has a background in Shinto, which explains her tendency to personify inanimate objects. I love personifying inanimate objects and/or anthropomorphising animals. It’s kind of my thing. So thanking a sweater for its service is cool by me. There were a few sweaters, in fact, that I once LOVED, but that no longer sparked joy, and I swear, when I was thanking them for their service, I really meant it. Whatever, I thank sweaters. So, after you determine which items don’t spark joy, and after you thank them for their service, you have to get rid of them. Fast. Give them to Goodwill, sell them on ebay, arrange a clothes swap with friends, just get them out of your house as quickly as possible! The longer these items stay in your home, the more likely you are to talk yourself into keeping them. Believe me, I’ve already felt the pull. I organized my rejects into three categories: donate to Goodwill, donate to Dress for Success, and try to sell. And I have to say, even handing off these bags to the Goodwill employee was kind of hard! I get attached to things. Step Four: Once you determine what you’re keeping, you organize it. Kondo says to discard first, and organize second. She also says that there’s a special way to fold everything, and that the item itself has to tell you how it wants to be folded. Again, a lot of people might think this is bizarre, but I not only find it delightful, I totally agree. (There are plenty of KonMari folding videos on YouTube if your items aren’t sharing with you their particular folding desires.) 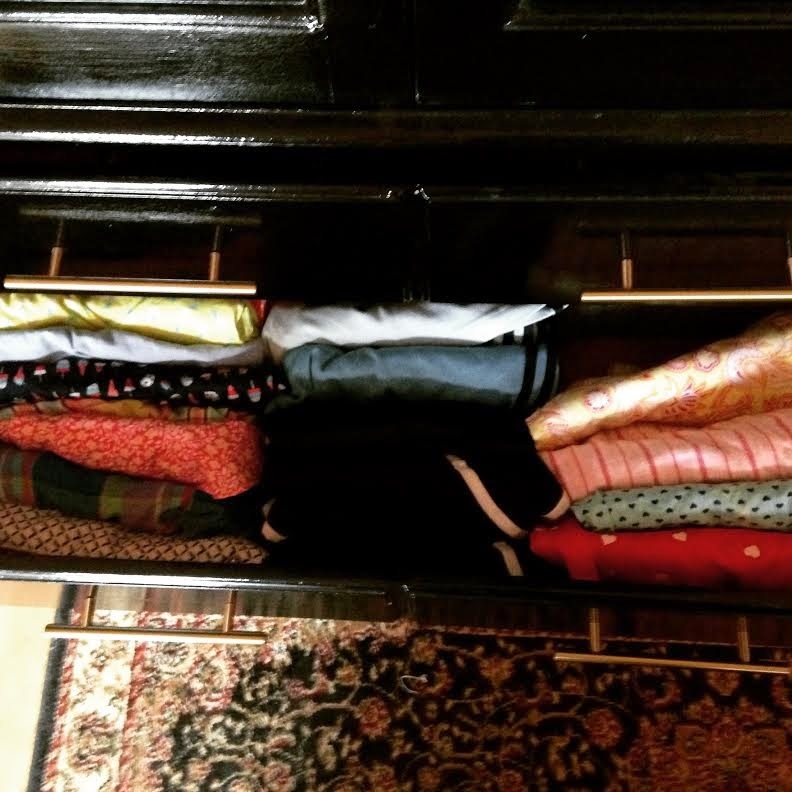 Kondo says that drawers hold more than hangers, and that folding your items so that they stand up (like files in a filing cabinet) as opposed to flat, utilizes the space better and makes it easier for you to find what you’re looking for. So, I did it. I didn’t totally believe it would work. I mean, if I folded my shirts like files, wouldn’t they fall over? But damned if KonMari didn’t have it right. This was my sleep/work-out shirts drawer. I pretty much wear tank tops all year ’round, for sleeping, exercising, and anytime I’m not out in public. I buy these from Eddie Bauer, and I love them. They aren’t haute couture, but dammit, they spark joy. 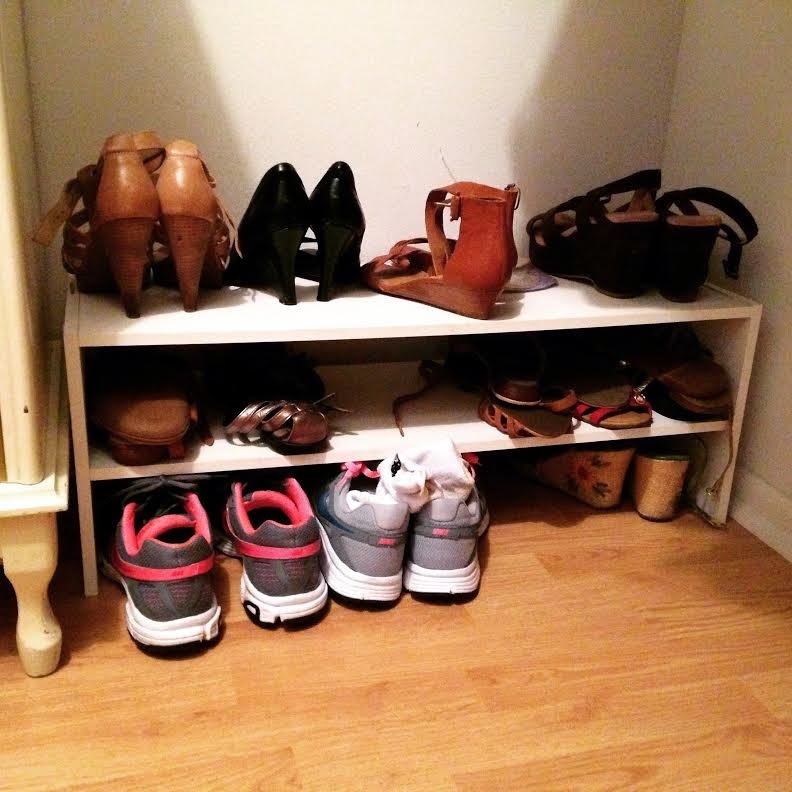 Kondo suggests using shoe boxes to corral smaller items. This worked well for my bras, socks, and tanks. 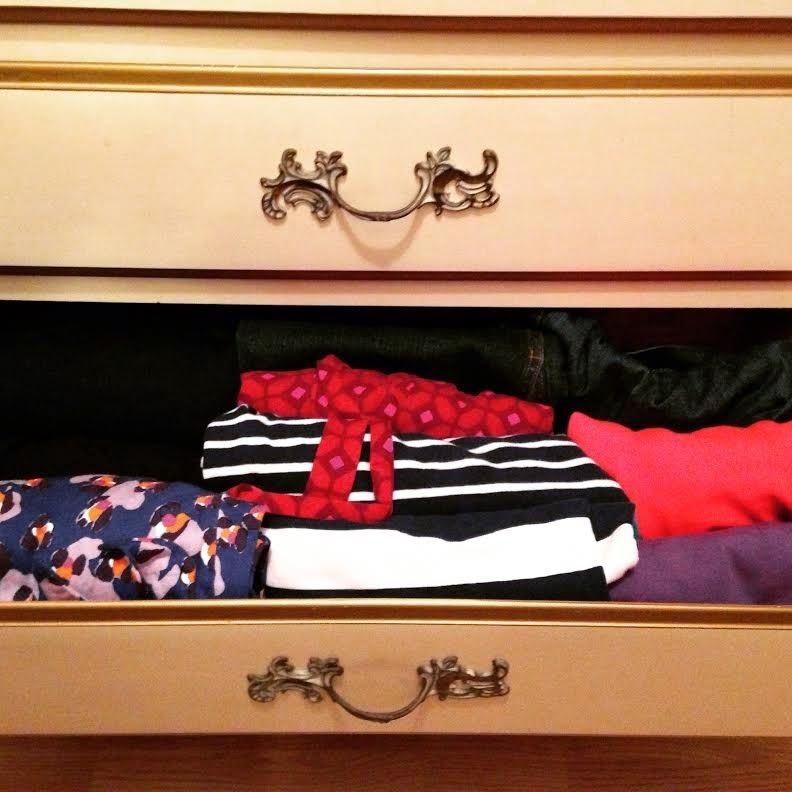 Here’s my sleep shorts/ exercise shorts/ PJ bottoms drawer. See how the shorts/pants are stacked standing up? You can see what’s there, and they take up much less space. If I need my red hearts PJ pants, I know exactly where they are. 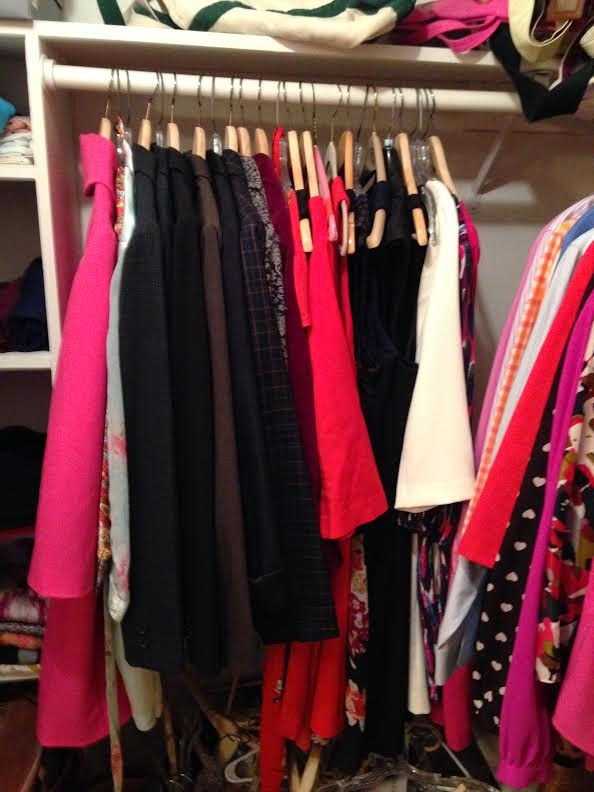 Kondo suggests folding most of your clothes, except suits, delicate dresses, and coats. I would add: clothes that don’t want to be folded, like button-down tops. 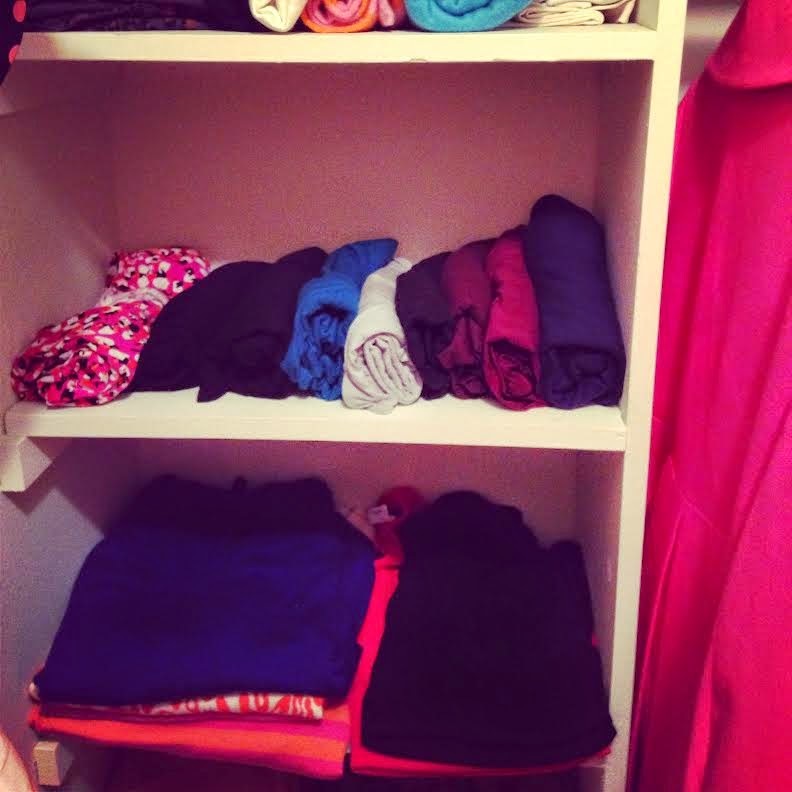 So, I folded my knit dresses, and my knit tops, and my sweaters, and I hung the rest. Knit tops and sweaters, above. Knit dresses and skirts, below. 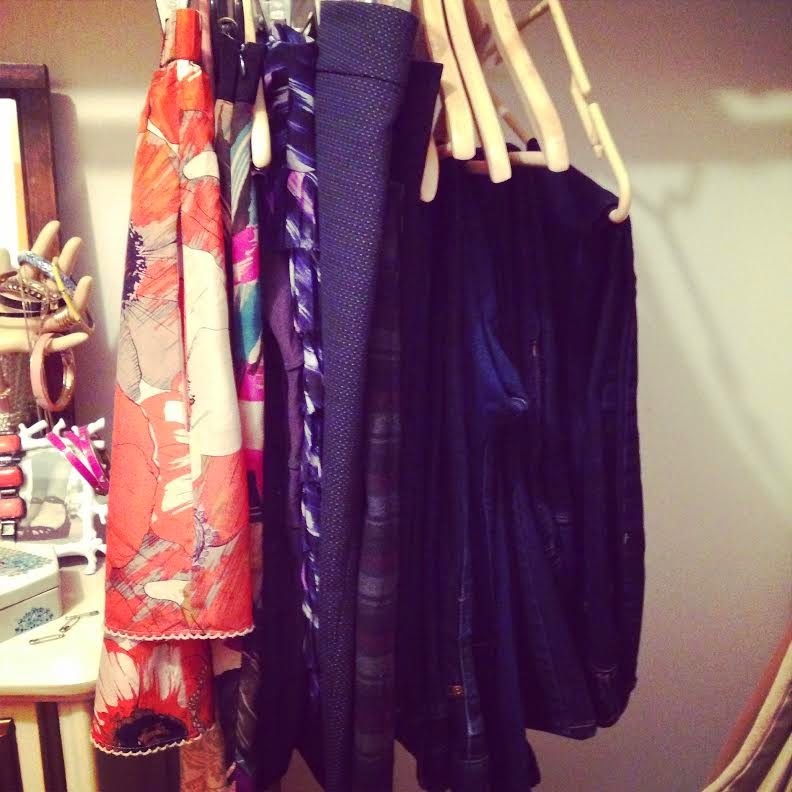 Skirts, slacks, and jeans, hanging! Tops, hanging! Think I like color much? See those wedges on the bottom shelf? I haven’t worn those in years, but I bought them when I lived in LA, and I still love them so much that I couldn’t bear to get rid of them. That’s the sort of joy-sparking that Kondo talks about, I think. 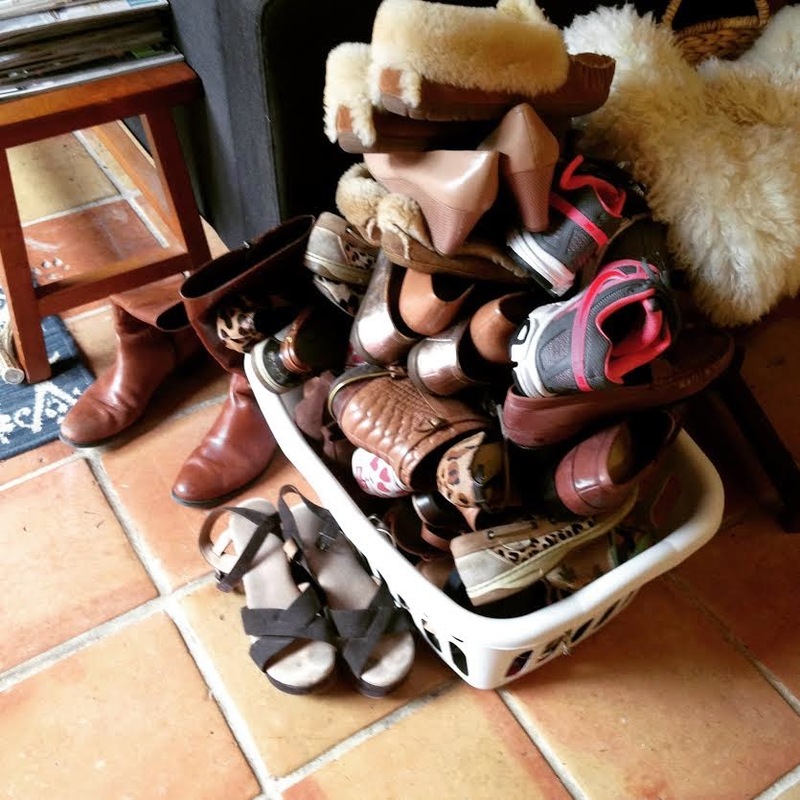 Primarily, though, I wear all of those shoes on a regular basis. It’s nice not to have a lot of clutter confusing things. 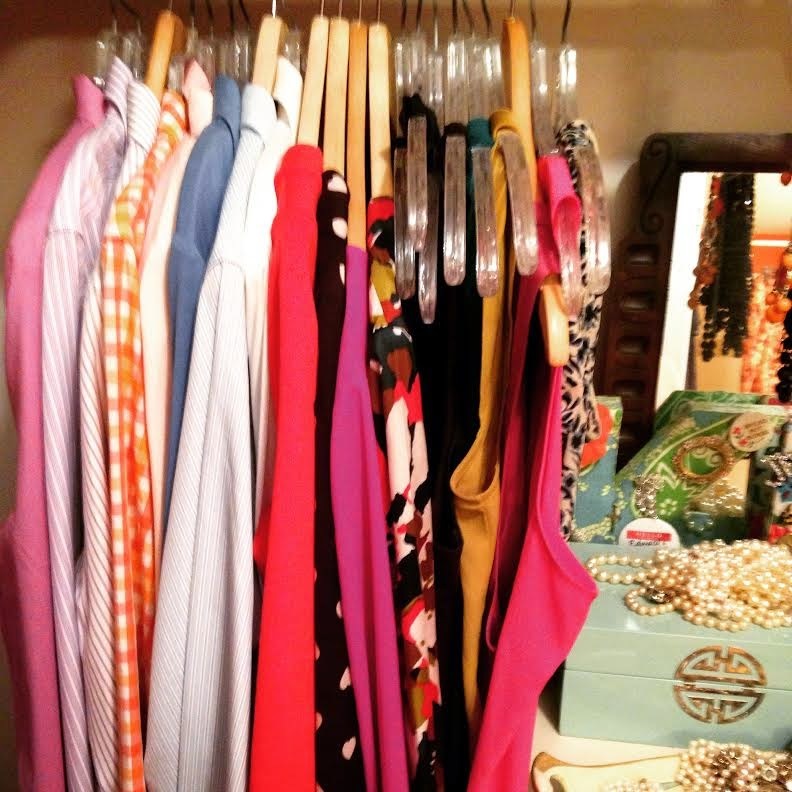 Once I put back all of my clothes, I felt like I had more choices, even though I have fewer clothes. And, whether it’s because I just touched each and every piece of clothing I own, it definitely makes me happier to look into my closet. It’s like I’m hanging out with a bunch of friends. And isn’t that how it should be? During normal business hours, Kat is a lawyer, but in her off time, Kat loves to cook, craft, and mix up fantastic cocktails. Kat lives in Florida with her husband and three dumb cats. While no doubt punky, Kat is not yet a punky mom.